There has been a lot of buzz around vallum farm in the last few months - renowned North East chef David Kennedy has just opened a restaurant there and the tea room has recently been awarded the accolade of best breakfast in the North East. Needless to say I was dying to go. Today was the fourth day of a particularly cold February half term and I decided a run out in the country would do us all some good. The tea room and ice cream parlour are housed in the same building - with one end being particularly family friendly with a small play kitchen for the children to play with. The menu is seasonal and local and all homemade. We loved the look of the ice-cream sundaes on offer but it was just too cold! 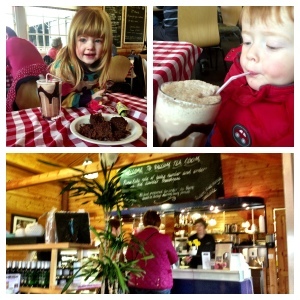 Instead we opted for 3 homemade chocolate milkshake's and 1 piece of chocolate fudge cake to share (Total cost £8.15). Although service was a little bit slow, it was a busy time of day and everybody was very friendly. The food and drinks were delicious and worth the wait! After our treats, we ventured into the outdoor play area. As it was so cold we were the only ones there! My children enjoyed the play frame, slide, see-saw and swings and it was nice to see a football net and a few football's knocking about. There was loads of space to run around and picnic tables near the play area. I imagine it would be a lovely place to spend an afternoon in the summer. 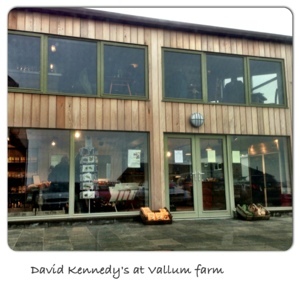 Vallum farm has more to offer than an ice- cream parlour, tea room, David Kennedy restaurant and play area. There are a few small independent businesses in other units within the farm including the Bywell Smokery which provides produce for the restaurant and tea room. There is a nice collection of local food, drinks and crafts on sale in a small shop. The artisan bread looked particularly tempting! There are also walks around the farm via a small nature reserve and pond for which a map is provided. 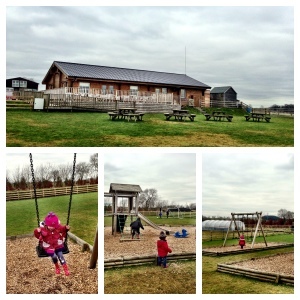 Next time you are looking for a a place to take your children for some much needed fresh air, I would definitely recommend Vallum farm as a place to spend a few hours. Can't wait to return when the weather's a little warmer!